The trenches in question were located close to the French village of Fampoux, east of Arras. The battalion had spent October at Hull Camp, St. Nicholas, near Arras and in support and front line trenches. Specific orders for the raid were written by Captain C.H. Carruthers, the Officer Commanding ‘A’ Company. Carruthers was to lead the raid, with 2nd Lieutenant Schutze and Beale, and 60 other ranks. The orders identified six parties with specific targets (provided by co-ordinates) within the German trenches. Some were to destroy dugouts, while others were to form stop gaps and protection. A parapet party was to cover retirement of all parties and “do anything possible to facilitate their exit.” Two Lewis guns with two men manning each gun accompanied the parapet part to deal with any enemy movement overland. ‘D’ company were to be utilised to place a tape from point of exit in the British lines to point of entry in the enemy lines. The raid commenced at 3 a.m. after a three minute intense bombardment. The night was fine, the moon being exceptionally bright. The assault party were forced to exercise great care in gaining their jumping-off positions. This, however, was accomplished without causing alarm to the enemy. At Zero the guns opened and the barrage came down well on the enemy trenches. The assault part moved quickly to the gap in the enemy’s wire. 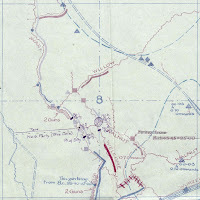 Promptly at Zero plus 3 the guns lifted from the point of entry and objective, but the raiders having negotiated the wire successfully, lost a minute or two in locating the enemy communication trench, which was the centre point of the operation, owing to damaged state of trench. By Zero plus 6 most of the party were in the enemy trenches, moving towards their various objectives. Two Germans were discovered and quickly killed. A little late a machine gun team was effectively dealt with, but the gun could not be brought away. A part of the enemy were then discovered to be moving into the raided area from the south and a stiff fight commenced. Eventually the party was driven off by rifle fire and bombs. While this was taking place, the centre party discovered a dugout which was sheltering a number of the enemy. This was bombed, and several Germans were killed and wounded on the steps of the dugout. An effort was made to get a prisoner, without success. On the signal of the Red Very light by the enemy, hostile trench mortars were fired on the raided areas from the support trenches. The O.C. Raid now decided to withdraw the party, and the signals were sent up, all managing to get back safely, with the exception of 1 officer and 5 men. The party immediately went out and stayed until dawn, and succeeded in bringing back 3 wounded men, 1 officer (Lieut. SHUTE). 2 men are still missing. At 3.35 a.m. a bouquet of multi-coloured lights were thrown up from the enemy support line. All was quiet and normal at 4 a.m. The Raid, generally speaking, was a good one. It is evident that many casualties were inflicted on the enemy, and if the raided area had not been fired on by hostile trench mortars a great deal of damage would have been caused to the trenches and defences. William had likely only transferred to the Battalion in August / September 1917. Born 1895 at Hotwells, Bristol, England, the son of Thomas John and Georgina Eliza Britton. Born 1893 at Berkeley, Gloucestershire, England, the son of James and Mary Jane Hill. 183rd Infantry Brigade Order No. 151. 23.10.17. T.S. Foweraker, Capt., A/Bde. Major, 183 Infantry Bde. Orders for Raid by “A” Company. 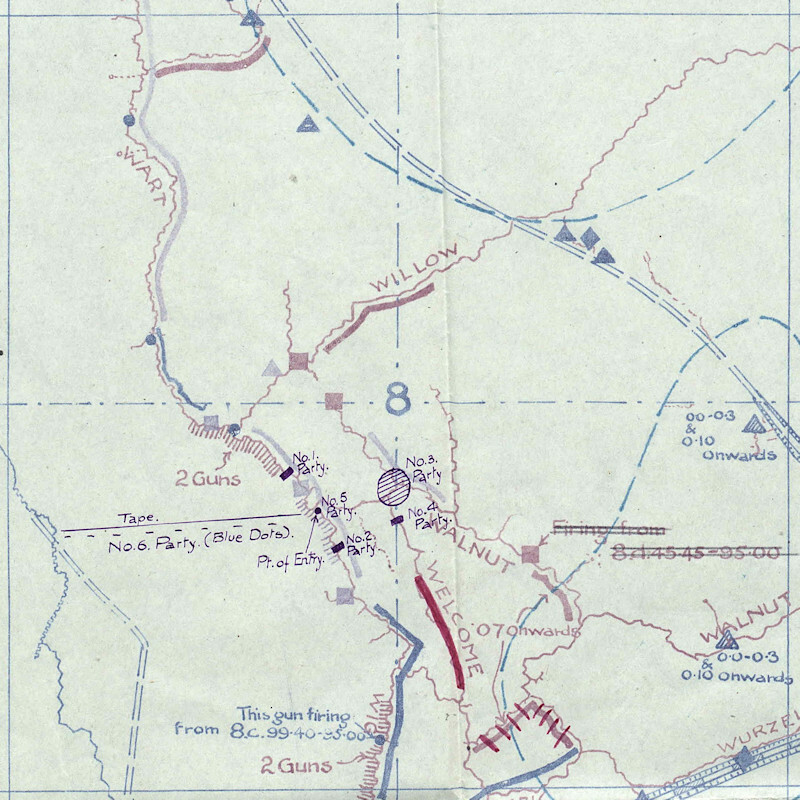 Report on Raid carried out by 2/6th Gloucestershire Regiment, on night of 29th/30th October, 1917. 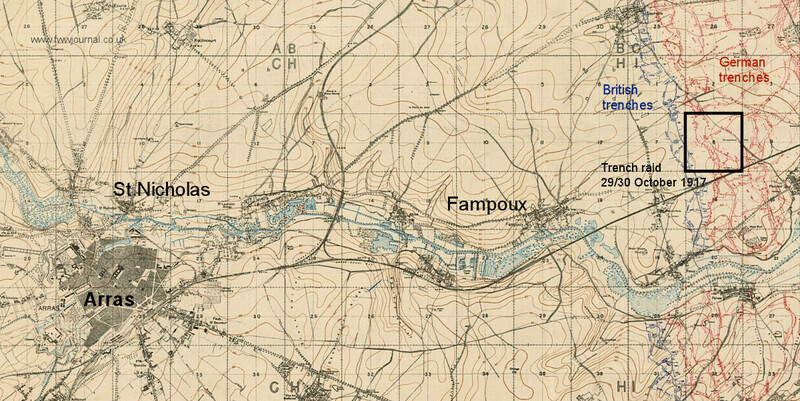 Thanks to contemporary trench maps and satellite imagery it is possible to find the exact site of the raid, which is open farmland today.